Infrared or ShadowSense, which technology is most suited to your business requirements? To ensure we are covering all businesses’ needs, Panasonic is delivering different technologies embedded in our professional multi-touch screen displays. We are offering interactive screens with whiteboard functionality that can be used for collaboration and Bring your own device (BYOD) environments including classrooms, seminar rooms, meeting rooms, offices, lecture theatres presentation rooms. 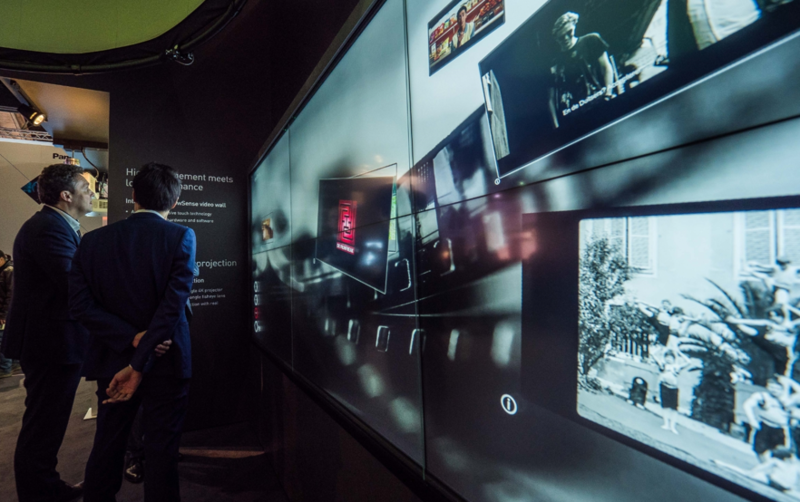 In addition our intuitive and robust touch screens are designed to interact with your audience or visitors and withstand challenging environments such as retail, transportation, live entertainment. 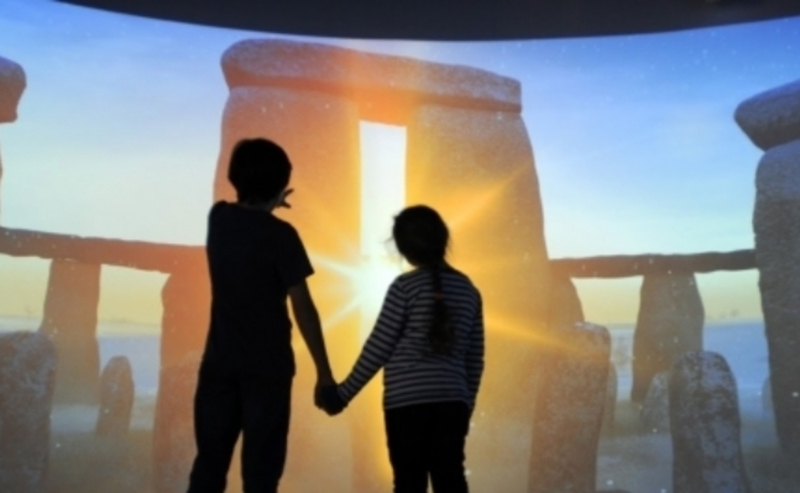 To create the highest impact and interactivity, the ShadowSense technology can also be embedded in flexible video walls installations ideal for retail, museums or even corporate environments. Read more below to discover which technology and solutions suit your requirements better. Commonly used because of its comparatively low cost, infrared is widely available especially in large format. How does it work? The bezels around the edge of the screen house infrared receivers and transmitters. 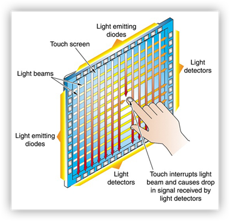 When a finger is placed in the (invisible) beam of IR light, the finger’s position is calculated. How does it work? 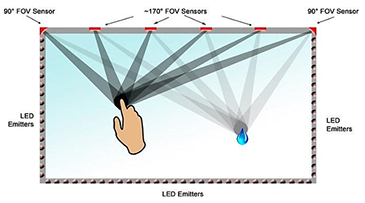 ShadowSense technology is a combination of infrared invisible light emitters and optical sensors around the display. The “shadow” of an object in the infrared rays is picked up by multiple optical sensors and computed to a position. Instantly differentiates between a finger, pen and eraser so that inking applications can be used without cumbersome control changes. Recognises the shape, size and pressure of any object whether it’s a bare finger, a gloved finger or a pen. Sensing the size of an object permits control over what is recognised as a valid touch versus an unintentional touch. Unlike optical and IR systems, it provides an unparalleled degree of immunity to high brightness and changing light intensities, even working in direct sunlight and studio environments. 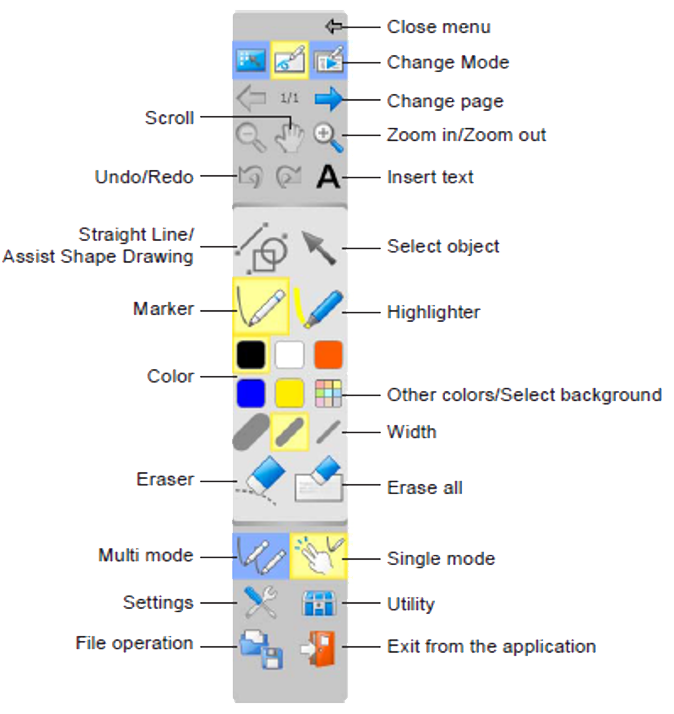 Will not fail if portions of the screen are blocked, or if individual components fail. This high level of reliability reduces touch screen failures that bring about unresponsive touch screens, to virtually zero. 4mm thick tempered glass covers the screen. Rugged screen that is scratch resistant. Create the ideal multi-touch experience with control over touch point separation, speed and size to prevent accidental touches. 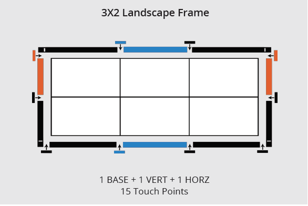 The multi-touch video wall solution is fully customised on your needs and is composed of multiple 55" screens built-up in different configurations. 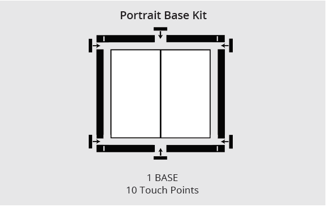 Installation of the touch overlay is included in a service package and is made on site. 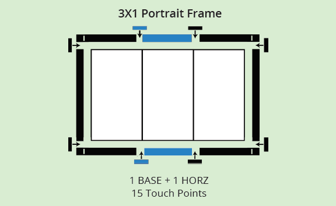 Sizes available From 43" to 86" Large formats 86" and 98" Large formats 65", 75" Large formats 65", 80" Small sizes 42", 49", 55"
Best solution for robustness, remote maintenance, high brightness and 24/7 use. High anti-glare, outstanding ambient light rejection. 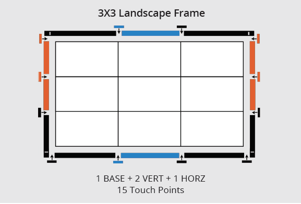 Best solution to create large size multi touch video walls. 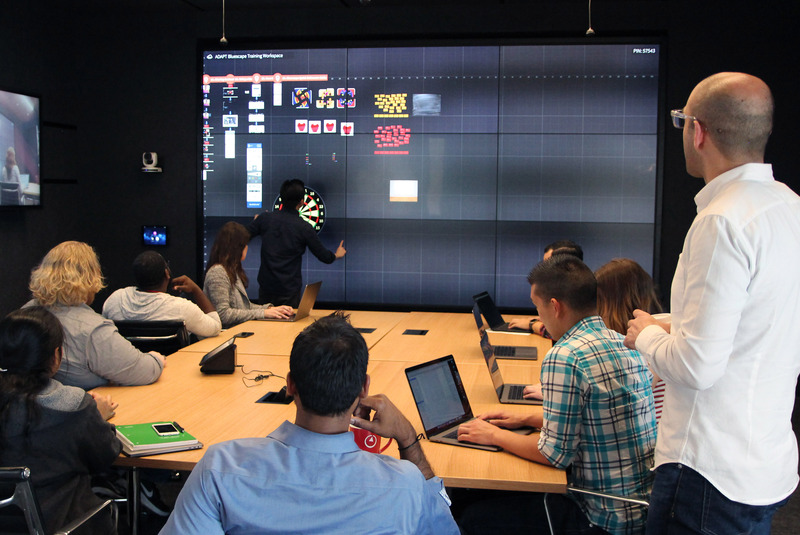 Real-time response of the touch area allows to create the most engaging environments. 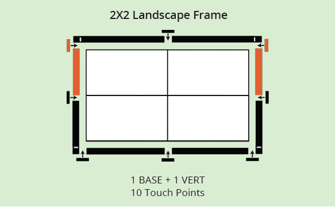 Most common configurations are 2x2, 3x1, 3x2, 4x2, 4x3 screens. Click here to see the possibilities. 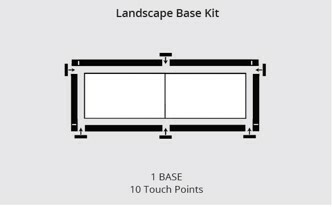 Contact us here so we can create your customised multi-touch video wall. 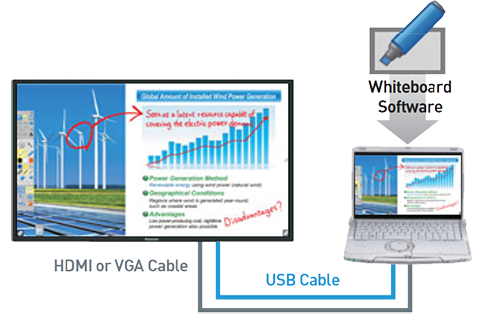 Simultaneously Monitor & Control displays/projectors from a single PC. This FREE software enables you to control/monitor up to 2,048 devices over a LAN network.